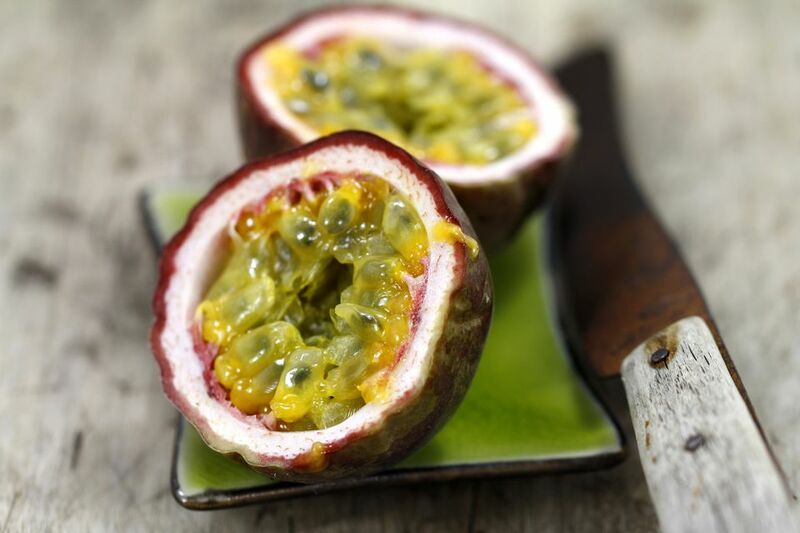 Passion fruit is native to the subtropical regions of South America, and it is a part of the local culinary tradition throughout the continent. Using it brings the flavor of South America home and lends authenticity to any menu of South American specialties. This sweet but tart fruit salad dressing complements many different combos of greens, and it's quick to make in the blender. Try it with a strawberry spinach salad or with a pear and blue cheese salad. Cut the passion fruits in half. Scrape the pulp and seeds into a small saucepan. Heat fruit pulp over medium-low heat, stirring frequently. Heat the pulp almost to boiling, then remove it from the heat. Strain the pulp through a fine sieve or colander. Discard the seeds and let the juice cool. Put the passion fruit juice, olive oil, lime juice, vinegar, honey and salt in a blender or food processor and blend until the mixture is smooth. Store the salad dressing in the refrigerator for up to one week. Stir or shake before using. Serve a salad sparked with blue cheese or a strawberry spinach salad with passion fruit dressing with other authentic South American foods for a trip to that continent right from your own kitchen. For a light meal, serve empanadas stuffed with cheese and ham, chicken, beef, corn or blue cheese. Other small meal options include a trademark Argentinian sandwich of chorizo or other sausage covered with chimichurri sauce or a humita, which is a dish made of fresh corn, milk, onions and spices that is popular in Peru, Chile and Bolivia. For dinner, the primo meal in Argentina centers around beef. Whether you favor a rib-eye, filet mignon or sirloin, steak is the meat to choose. Short ribs are also a choice with Argentinian bona fides. Don't forget the chimichurri sauce with whichever of these cuts of beef you choose. Either goes great with a salad dressed in passion fruit dressing. Add Patagonian potatoes, a sort of pan-fried take on french fries; roasted potatoes with basil; roasted potatoes with vinegar and coarse salt; or french fries. You get the picture: Beef (preferably steak) and potatoes are an Argentinian staple. Choose what you like best, but stay with that basic plan, along with the salad, for a taste of South America. For dessert, tres leches cake with dulce de leche, chocotorta with dulce de leche, chocolate mousse with pisco, rice pudding with raisins, queso y dulce or flan.